U.S. Marine Corps General Thomas Waldhauser speaks during a press conference at Camp Lemonnier in Ambouli, Djibouti on April 23. China’s opening of a military facility in Djibouti just a few miles from a U.S. base should spark a new era of cooperation between the two countries in Africa, according to the top U.S. commander on the continent. Beijing formally opened its first overseas military base in Djibouti in August, providing China with a naval outpost on the Horn of Africa close to crucial but dangerous shipping lanes in the Indian Ocean and the Gulf of Aden. Djibouti is also home to Camp Lemonnier—the only permanent U.S. military base in Africa—which is home to around 4,000 personnel and serves as a hub for American counter-terrorism efforts in places like Somalia, where U.S. troops and airstrikes are targeting Al-Shabab, an Al-Qaeda affiliate fighting the Somali government. “Across the continent, we have shared interests in African stability. We see many areas where we can cooperate with the Chinese military. For example, we both support U.N. peacekeeping missions and training with African defense forces,” said Waldhauser, in a speech at the United States Institute of Peace. 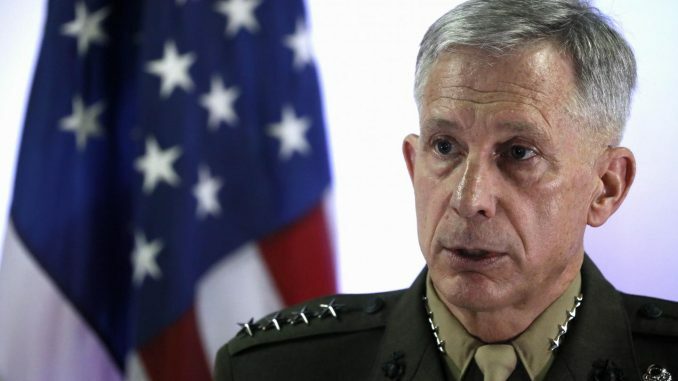 Waldhauser said that China assigned its first batch of soldiers to the Djibouti base this summer and had expressed interest in conducting joint amphibious training with U.S. Marines. China and the United States have long been rivals in competing for international influence in Africa. China is the continent’s single largest trade partner, but the United States remains the largest inward investor in Africa, according to a recent survey by EY. Beijing has poured billions into massive infrastructure projects in Africa, such as a $3.8 billion, 298-mile stretch of railway connecting Kenya’s capital Nairobi and its port city of Mombasa. China also has close ties with many other African nations, including South Africa and Zimbabwe, where it has given loans or provided labor for building roads, transport links and power grids. Relations between the two countries under President Donald Trump have been mixed. Trump hosted Chinese President Xi Jinping at his Mar-a-Lago resort in Florida in April and hailed Xi as doing “an amazing job.” But Trump has also criticized the Chinese government for failing to rein in its ally North Korea, which has continued its path of nuclear proliferation and vowed to strike the United States if necessary. U.S. officials and analysts raised concerns about the proximity of China’s base in Djibouti when it was being constructed, speculating that it could heighten fears of the two militaries spying on each other’s activities. Besides China and the U.S., Djibouti hosts military personnel from several foreign countries, including France, Italy, Japan and the U.K.